Rock your Touring Bike with this hot-looking twenty-four (24) piece CVO inspired Flame Graphic kit! Available in one (1) of two (2) color combinations (Hot Flamez or Neutral Flamez), Flame design elements feature gentle faded flames with ghost flame elements. Digitally printed with DuraCOLOR graphic technology, kit is manufactured with premium automotive grade metallic vinyl film materials. Vinyl product is manufactured with a grey-pigmented solvent-based repositionable adhesive and cast construction for highly conformable performance of the most difficult curves and irregular surfaces. As a further step, graphic is covered with a 2 mil clear laminate (Gloss or Matte) which provides protection from miles of abuse. While graphic kit is designed, fit and manufactured for a ‘16 H-D Street Glide, with slight trimming and fitting pieces may work with previous year models and bike styles. Harley-Davidson lettering shown on tank graphic IS NOT included with kit. 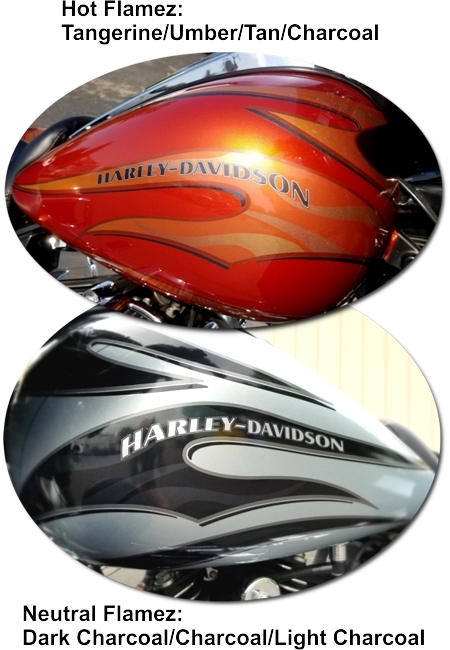 We DO NOT include any Harley-Davidson logos or lettering with kit. If desired, you may obtain logos or lettering from Harley-Davidson or from a local vendor and place such product on top of the flame graphic element as illustrated in image(s). Due to the nature of multi-contoured surfaces of Harley-Davidson bike models (i.e., tank, fender, etc. ), certain pieces of this kit may require professional assistance.